Thanks for coming out to run, walk, or dash! I have put my welcome remarks, and Danny Martin’s race call-and-response below. Good morning! My name is Rob Cummings – I am the race director for this event. Welcome! First we will have the 5k runners go. After they are in the woods, we will release the 4k walkers. When the 5k & 4k runners and walkers are finished on the track, we will have the Kids 200 meter Jay Dash on the track at around 9:45-10am. Let me tell you a bit about the course & trail. 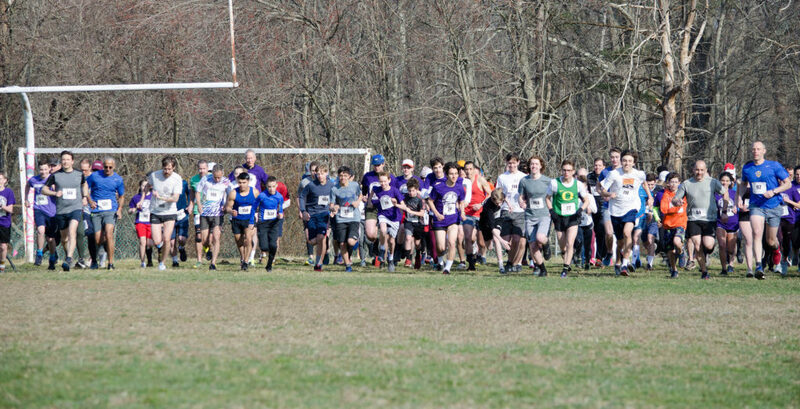 RUNNERS will begin by heading towards the other upright on the opposite end of the field. Runners will go around the upright, keeping it on their RIGHT side and then turn and head back to this upright, also keeping it to their RIGHT side. (This will help stretch the runners out so not everyone enters the trail at the same time!) Then runners will head into the trail on the opposite end of the field. Later in the race you will come across this field following the pink flags but you will turn uphill towards the contest field. The first 1/2 mile of the trail is still recovering from the late winter and recent spring storms and hasn’t quite dried out yet… SO YES, there IS mud in this trail race! My advice is to keep calm and run straight through the mud. If you are walking, it is possible to carefully avoid the mud by using the strategically placed boards and logs. BUT If you are running we highly recommend avoiding those things as they will be very slippery after about the fifth person uses them. Run through the mud! Follow the pink flags. Course marshals are out there and can help in case of injury or getting lost. We also have course sweeps. If you are injured you can wait for a course sweep and they will help you out. We have a Lewisboro Volunteer Ambulance Corps crew on standby near the finish line if you are in need of any assistance before, during, or after the race, walk, or dash. Thank you to our sponsors – they help to underwrite the race and we are very grateful to have all of them as supporters of the new trail system and the race. Northern Westchester Hospital is our premier sponsor. Thanks to Cross River Pharmacy for not only sponsoring the race, but hosting our pre-race bib pickup yesterday. Thanks to Gold Sponsors Green Way Market the new grocery store opening in Orchard Square and Copia Home & Garden in Vista. Thanks to John Jay Alumni John Swertfager and Skaz Gekaj of Apex Fitness for their generous sponsorship. Dr Stu Weitzman was our first sponsor to commit both years and he’s running today with two of his boys — and his youngest is running the Jay Dash. Bradsell Contracting returns as a sponsor and we added La Familia and 850 Restaurant this year. One of our sponsors, Bluebird Ice Cream, has generously offered to donate 10% of your ice cream purchase to the trail building fund for two weeks after the race. 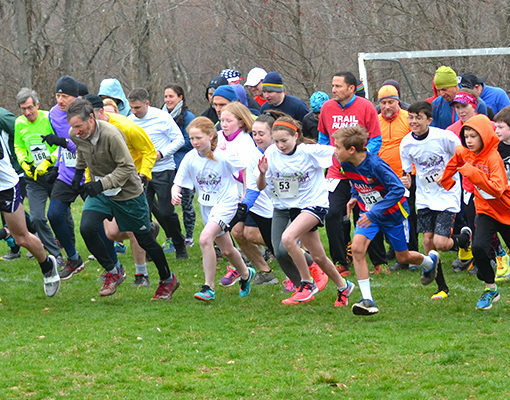 Just mention the race – and Señora Kessler will keep track and donate. They open at 12:30 today.… We have many other sponsors (check the back of your shirts!) but I will ask you to check our web site for links and information. I also want to thank our fantastic Cross Country & Track coaches — Coach Alex, Coach Guz, Coach Tom, Coach Paul, and Coach Keri. They have done a great job with the teams. Thanks Coach Tepper from the JJMS modified team. Many members of both the high school and middle school teams are running and volunteering today. 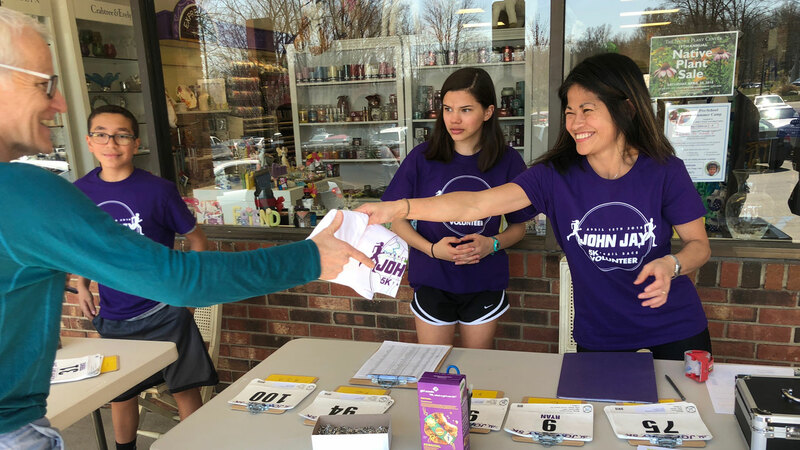 Thank you to all of the wonderful volunteers — if you volunteered ONE hour or HUNDREDS of hours you have helped to move the project forward and helped make the race happen. We have volunteer race photographers out there trying to catch your good side — or maybe your race face! Check their albums after the race here. 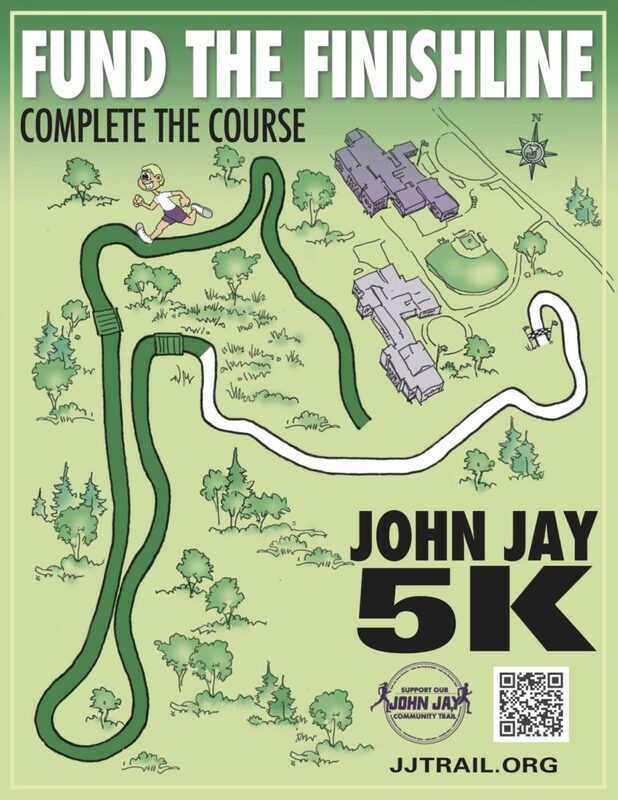 Thank you to the many runners and families who donated to the development of the John Jay Community Trail. 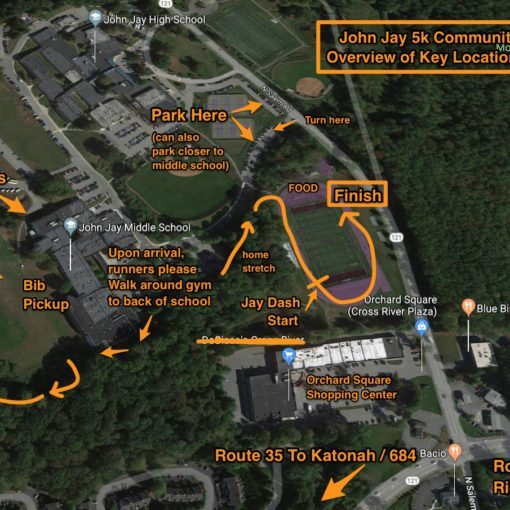 We are in a “Fund the Finish Line” final push drive started in 2019 that aims to raise $15,000 to complete the course so John Jay Cross Country teams can host a home meet! We are at just under $10,000 of the $15,000 needed raised. 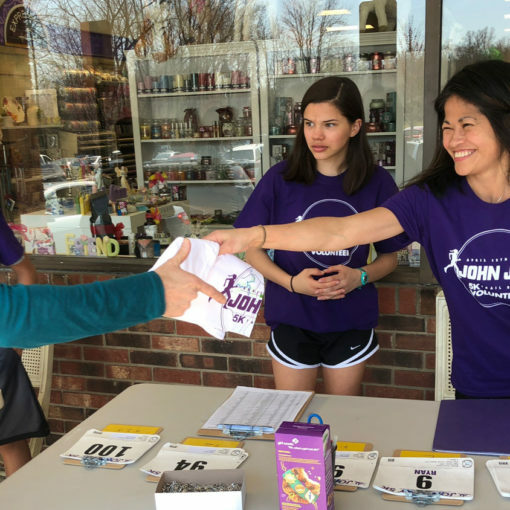 Donations will remain open online through June 30th and you can also mail trail donations via check using the online form at jjtrail.org. The goal is to have the course complete by Fall. There are many more people I can think of to single out for thanks, but if I mentioned everyone who has helped so far we’d be here all day! As race director I get the perk of choosing who gets “bib #1” for the race. This year I picked two extremely deserving people who are “graduating” this year along with their youngest kids. When we first came up with the idea of having a race, I knew we’d need a lot of dependable help. Having these two folks on board from the start has made everything go much more smoothly! 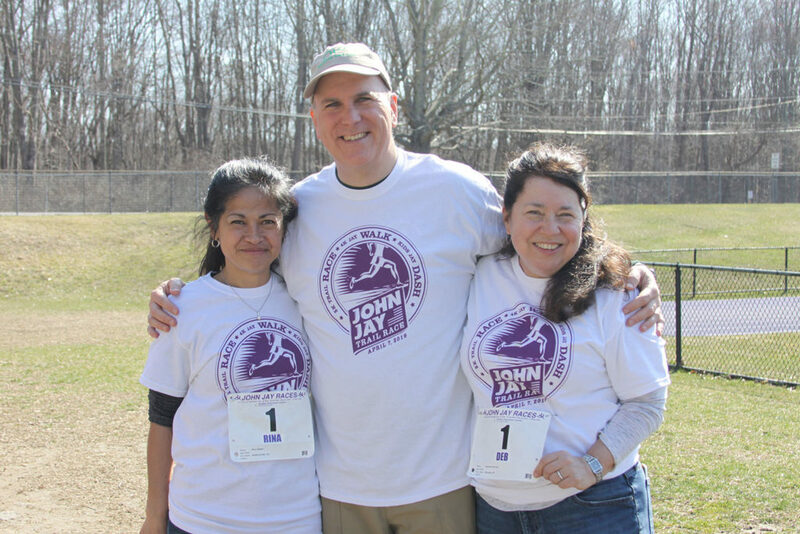 Deb Burman and Rina Pollak – thank you for all of your work with the race, the team, and the trail. Without question, the race has been a giant success as a direct result of your involvement. Thank you!! 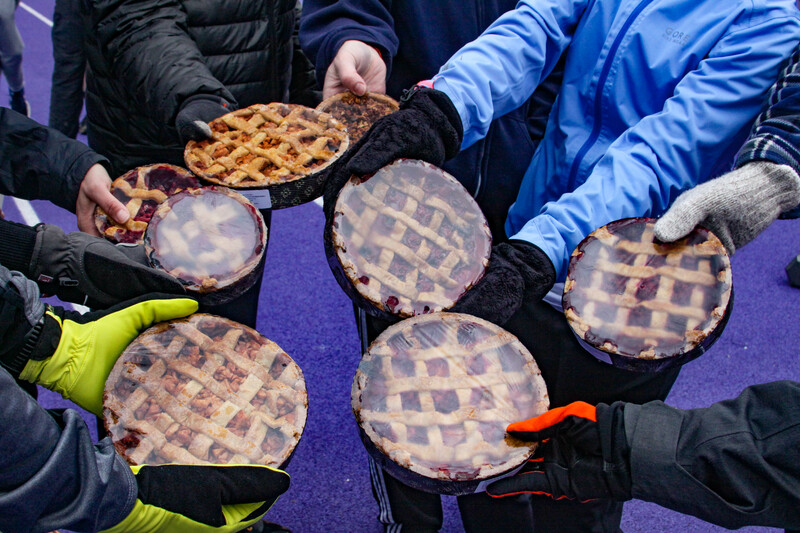 Here are your #1 bibs – Rina and Deb you get a choice of pie to take home — and a well deserved round of applause! 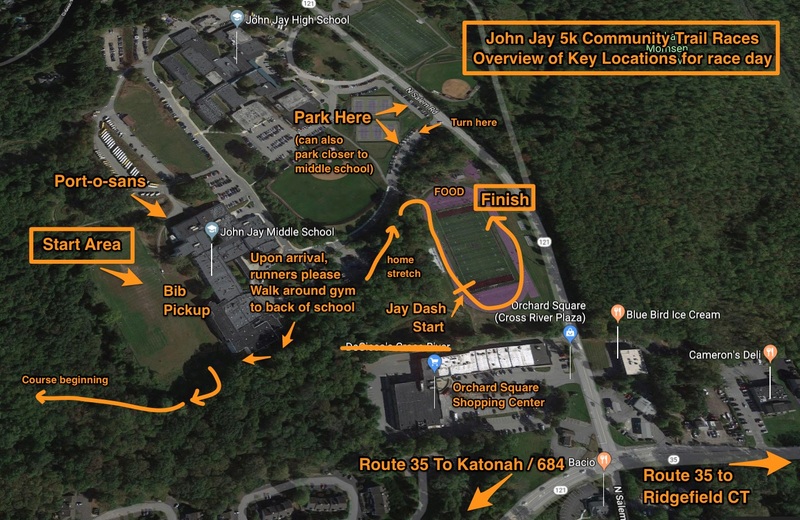 If you have run in the Leatherman’s Loop or Run The Farm, you have heard Danny Martin give his pre-race blessing of beauty and his Run the Farm call-and-response. Danny lives in Cross River and is a true treasure in our community. Today Danny is going to give our little race something unusual — and after he finishes we will start the race. Danny’s call and response is about traveling and learning on the trail of life. Something to think about while you run and after you finish. At this gathering we are learning to follow the trail of life.